In 1975 I was working for Tilden-Rent-A-Car in Vancouver. “In Canada it’s Tilden,” I was told to say when I answered the phone. Winter Sundays were days when nobody came to rent cars. I attempted to read but the manager would then make me wash windows or sweep and mop floors. It was then that I learned that sitting on my bench and looking out of the window gave me the opportunity to do lot’s of thinking. It was one of those slow Sundays when I noticed that two cars, parked in front of the long gone and lamented cheap beer hotel, the Ritz, on Alberni Street, had their four way flashes going. I noticed that every once in a while, both cars’ lights would flash in unison. But the moments were fleeting and the lights would then blink in complete discord. I knew enough mathematics to figure out that a couple of sine waves plotted on a graph would coincide at nodal intervals and that I could then predict when the lights would behave in simultaneous unity. Moments later I found a parallel between the lights and human relationships. A couple of months ago my granddaughter Rebecca made an uncharacteristically intimate question. She asked me why it was that when you liked someone, that someone would like somebody else. I cited the flashing lights on Alberni Street and she seemed to understand. Soon enough the young man in question dumped his girlfriend and directed his interests to my granddaughter. In some way all human relationships, between friends, between brothers and sisters and, as I have come to understand, between grandparents and their grandchildren, are all subject to the flashing lights. When my granddaughter was 6 I was adored and her company was one that I treasured. She would pose for my camera with a perfectly straight face. My friends and relatives would ask me why it was that Rebecca never smiled. I told them that she had never offered to do so, so I had become accustomed to her beautiful but almost off-putting and penetrating stare. During out trip to Texas in the Malibu which ended this past Sunday, her smiles were limited to watching movies in the laptop in the car’s back seat or when chatting with her friends on facebook either on her iTouch (which I bought for her a year ago) and with the laptop which I asked her father to provide us with! At all other times there was look of melancholy. Few, if any of us, can look back and try to remember what it was like when we were 13. I cannot. But I don’t think that my life was as complicated as Rebecca's. It had fewer options. I could go to the movies or watch b+w television. My music of the day was jazz, and perhaps only in this was I different from the norm. It was when I was 21 and in the Argentine Navy that I finally realized that the desire to conform was suddenly anathema. We conscripts would bend our German submariner type caps to suit our efforts to not look exactly like everybody else. I wore expensive sunglasses and carried and equally expensive black leather brief case. I did not look like the average conscript. Perhaps at age 13 I conformed and even did my best not to stand out. My Rebecca, like the girls of her age, listens to the same music. To my uneducated ears the singers all seem to be women who drone on with rhythms that are obsessive and repetitive. The all sound like Deborah Harry at her worst. When I was "fixing up" the startling picture of Rebecca staring at Bryce Canyon, Utah I though of a little essay by David Colman from Sunday, July 10th, Sunday Styles section of the New York Times. It is about a device that James Gleick owns. Gleick, the former NY Times reported and editor who wrote a beautiful (and even short) biography on Isaac Newton has a van der Pol oscillator. The machine is designed to make noise. It starts with a simple tone, which as one turns the dial that gradually increases the frequency, jumps up to a higher tone. Not quite regularly. In between tones, as the pitch gets highter, there is the unmistakable sound of scratchy noise. What is the connection between Balthasar van der Pol’s oscillator and life (and music, and just about everything else)? 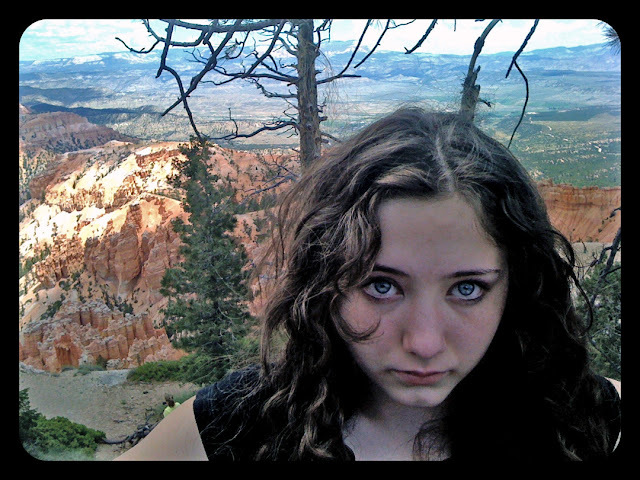 As Rebecca grimly stared at my iPhone camera in Bryce Canyon in Utah I felt confused. But I now understand that I must be patient and just wait for the oscillating to happen in my direction much like those two cars in front of the Ritz. Sooner or later Rebecca and I will flash together!